Milagros® is proud to offer an attractive line of Laminated Holy Cards from Ambrosiana™ featuring the exclusive images of the most popular Catholic subjects. Complete with fresh, new Ambrosiana™ artwork with subtle gold stamping and a classic prayer on the back suitable to the image, these cards are sure to be the retailer’s favorite for years to come. 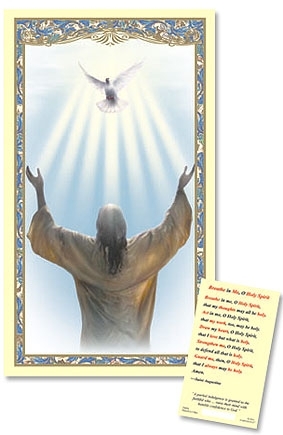 O Holy Spirit, Beloved of my soul…I adore You. Enlighten me, guide me, strengthen me, console me. Tell me what I should do… Give me Your orders. I promise to submit myself to all that You desire of me and to accept all that You permit to happen to me. Let me only know Your Will. Amen.